I will keep this image account short. The weather situation has been really crazy in N. Ireland between August 11th - 16th thanks to a series of large slow moving low pressure systems sweeping in from the SW Atlantic Ocean and rotating over Ireland dumping incredible amounts of water over the country. 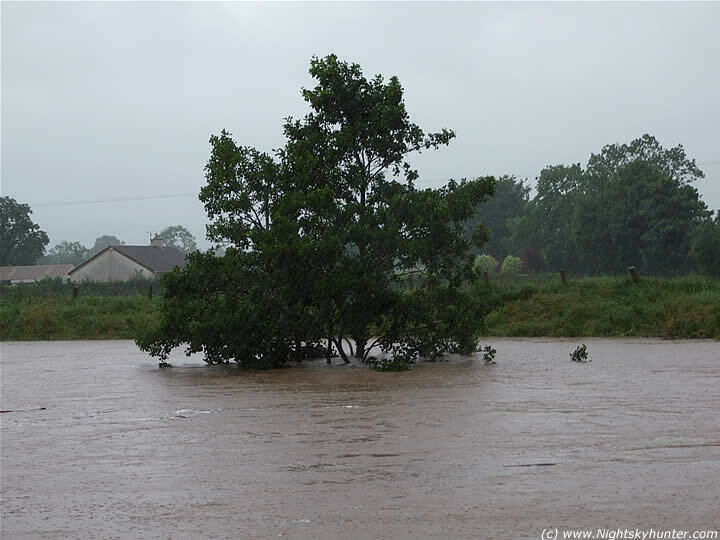 On the 11th we had a good thunderstorm in Maghera which produced substantial rainfall and local floods. 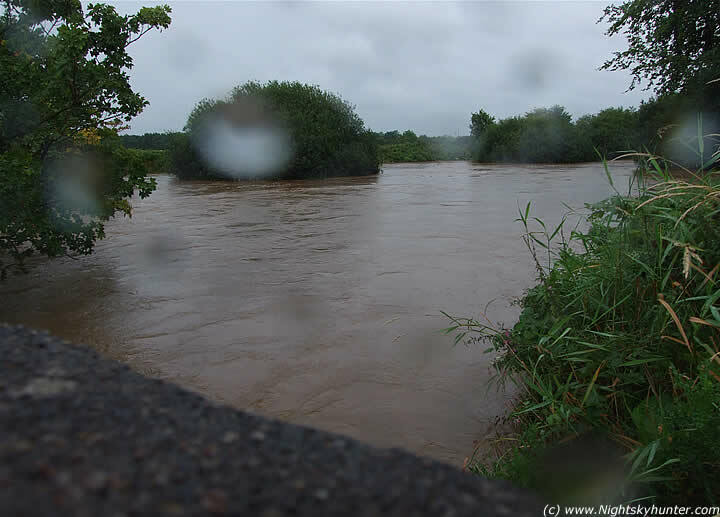 On the 12th the Moyola River already looked impressive. 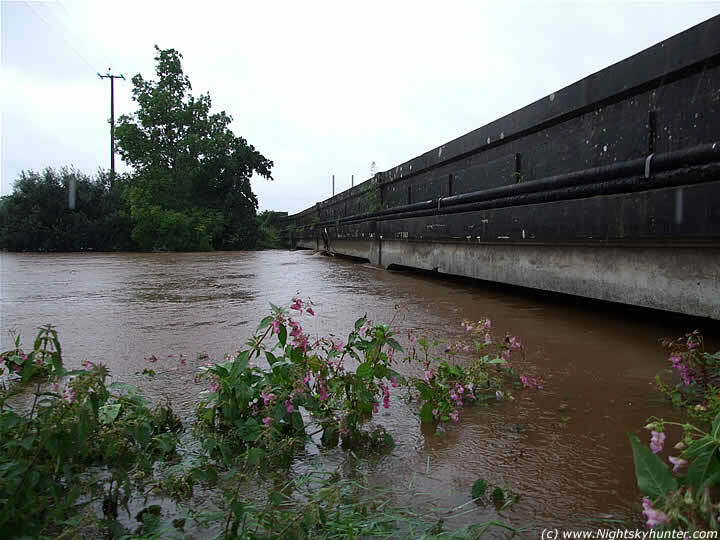 It kept raining, then on the 13th we had another storm with yet more rain and striking floods. By the 15/16th period it went crazy. My location in Maghera alone had 24 hours of intense rainfall. On the morning of Sunday the 16th the radar was impressive showing large red and white echoes over N. Ireland with the most intense hits over central and eastern areas. The front actually slowed down which made things worse. The situation looked so serious that a big discussion was issued on the UKWW forum. 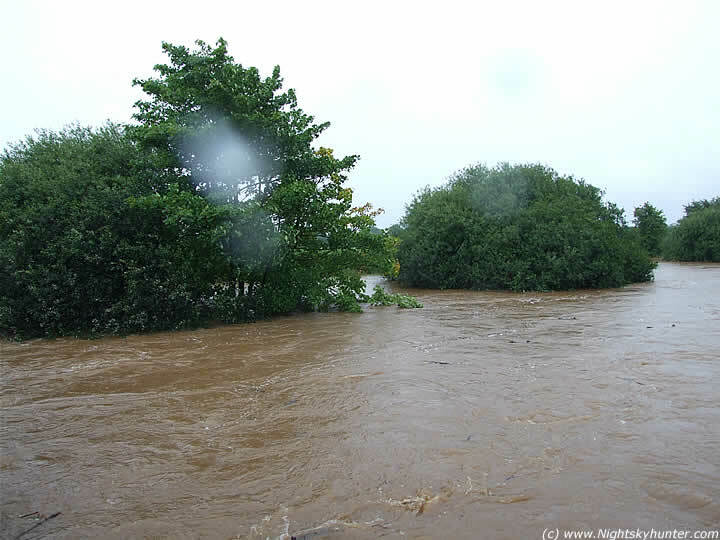 Images arrived in showing the Moyola River in severe flood and when I seen them I couldn't believe the state of flood. I promised myself a few days ago that I would go out there during the next severe weather event and by 18.00 BST I was on my way. The light levels were getting low so there was no time to waste. 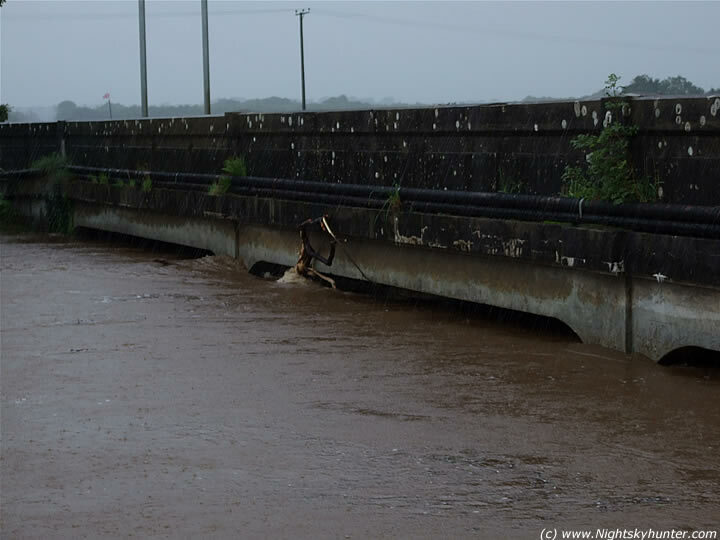 The most obvious place to check was the Main Moyola bridge between Maghera and Tobermore. When I got there I instantly knew that this was local history in the making so I was glad to be there to document the event. This was big news, there where cars full of people checking out this attraction from mother nature, entire families, photographers, fishermen etc had gathered to watch this amazing flood. There where plenty of Police cars and fire trucks in the area. 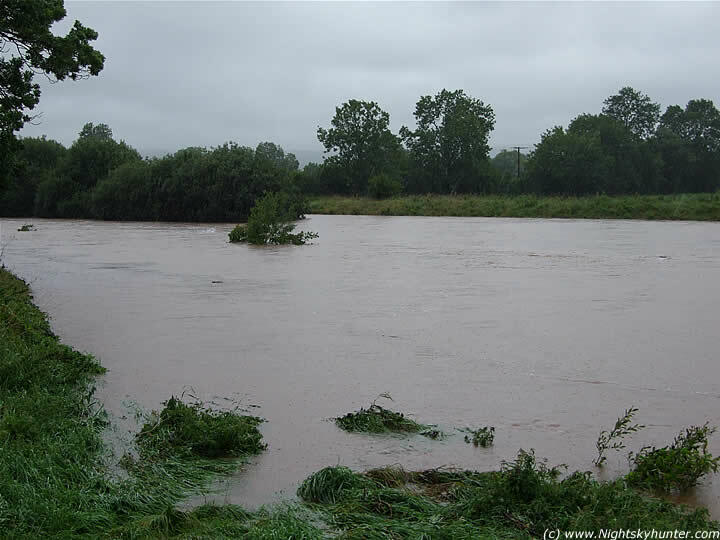 By this time I heard that the N. Ireland floods had made the international news!. So I got out and took some images under extremely difficult conditions. It was raining heavily with regular gusts of wind so I had to hold a large umbrella in one hand with the camera in the other, under the umbrella, to keep it try. These images were taken quickly using auto mode. This was the scene over the western side of the bridge. I climbed over a gate and got down close to the edge. The water was quite fast moving and solid brown in colour. It was nasty!. I went as near as I could to the water but not to close. If I went in, I would be a goner. My father is a keen angler and conservation officer of this area for much of his life. Every time there was a major flooding event he would always take me out to see it. I have seen some amazing floods here before over the years but as far as I can remember this was the worst I have ever seen. I heard some of the more elderly men nearby say the same thing. In order to understand how severe this was you would really needed to have seen this before the deluge. I happened to be in this exact area a few weeks ago when the the weather was very dry. In places the water was only about 6 inches high. Now it must have exceeded 15 ft. 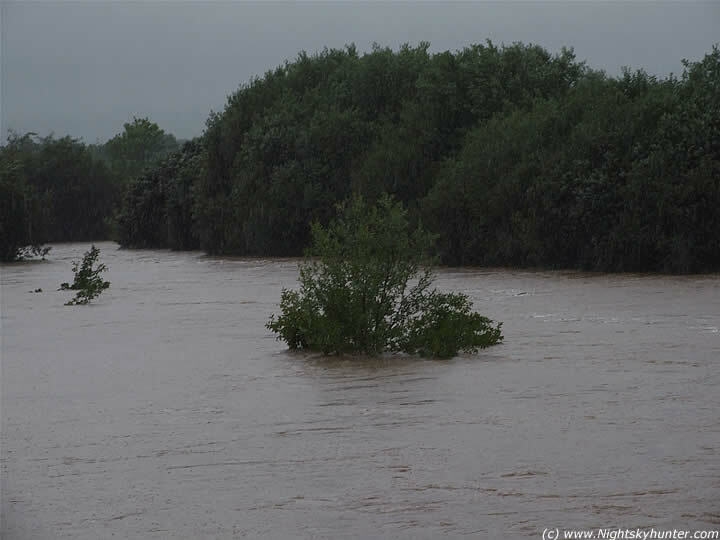 There was plenty of trees and branches floating down the river. This is looking up river. Motion of the river is L to R.
This very tall tree marked the right (N) edge of the old river bank. I have marked the extreme edge of the old banks here. Two weeks ago I could have walked across this area by standing on small rocks. The banks of this river must have burst hours ago. The fields on either side looked like lakes. 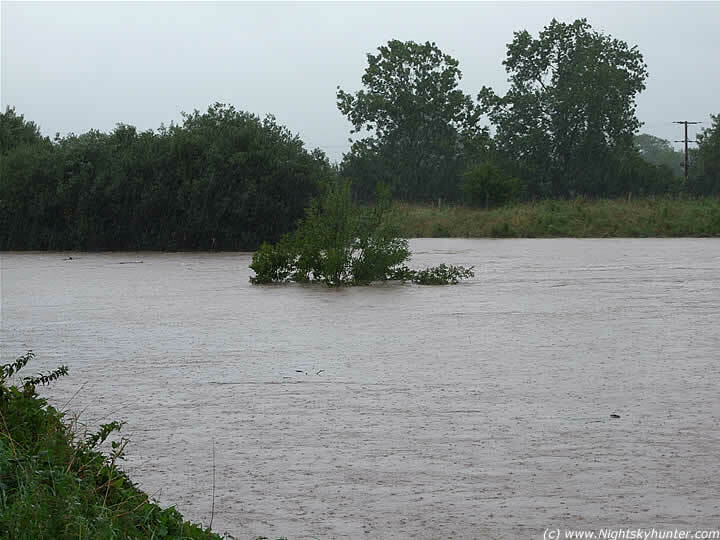 The Moyola golf driving range was completely under water and the 'stands' looked like an island. It was incredible. 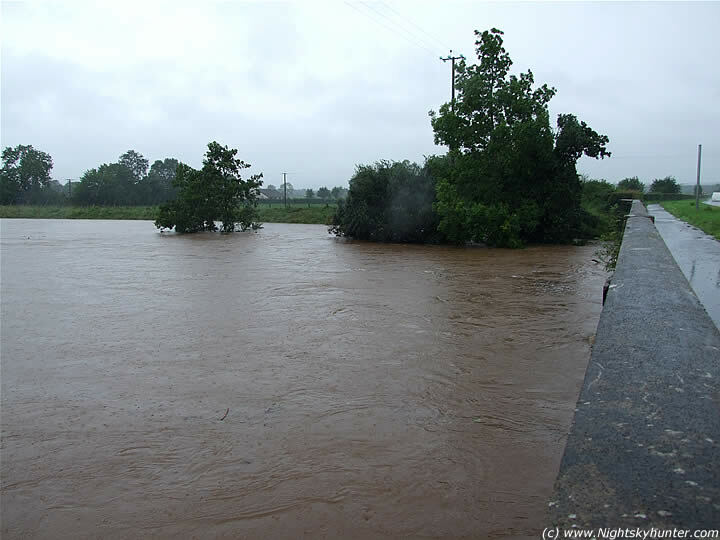 Here's the Moyola bridge. Camera looking N. The flood is at the very top of the arches. 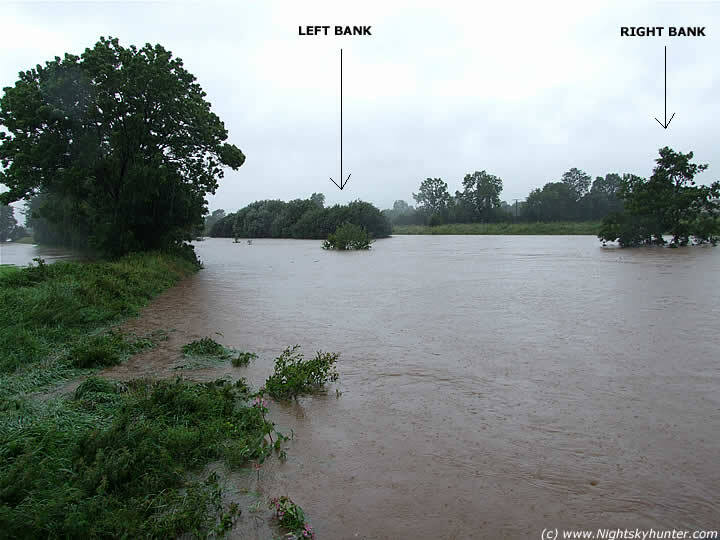 The old bank is under that arch on the R hand side. You can stand under it and look up, the ceiling of the bridge would be 8 to 10 ft above your head at its highest point. The flood had filled that entire area. Plenty of debris got smashed against the bridge. The water had already broke onto the main footpath and road to the R.
Strong gusts of wind almost tore the umbrella away from my hand so I put it down. Camera is really getting it now. On the way back to Maghera. 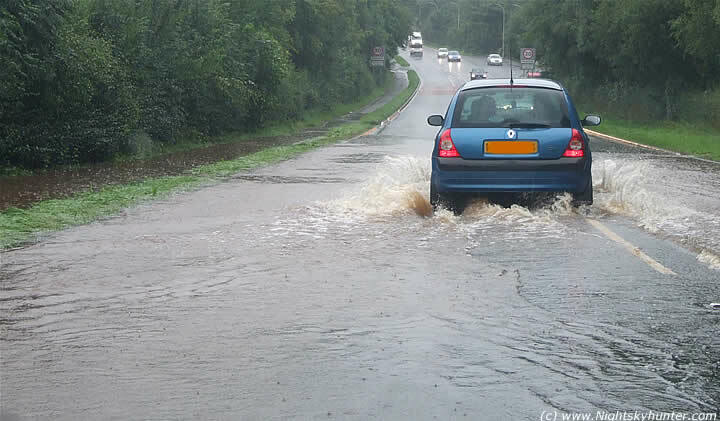 Plenty of flooding on the roads. This was tame compared to what others got. ''Rail services were severely disrupted following this morning's derailment of a passenger train south of Portarlington Station. In a statement, Iarnrod Éireann said that a total of 310 people were on the train, but no injuries were reported. A fleet of buses was brought into operation to transfer passengers to their destinations. A spokesperson said the driver's actions had prevented a more serious incident. He is being treated for shock, but otherwise is uninjured. The incident occurred after debris from a landslide on the line forced the engine off the track. There is continuing disruption to all services between Dublin and Cork, Kerry, Limerick, Galway and Westport''...RTE. 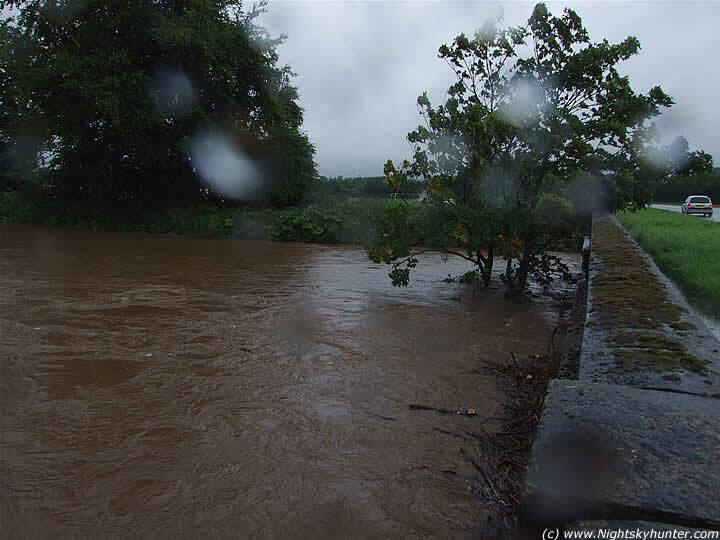 "Portglenone and Aghadowey are practically cut off, it seems. There have been several landslides, including one about one mile from the Spelga Dam on the Slievemaman Road in Newcastle, Co Down." Newcastle Town Hall and the town's Presbyterian church were opened as shelters for those affected by the floods, as was Watty Grahams GAA club in Maghera, Co Derry. 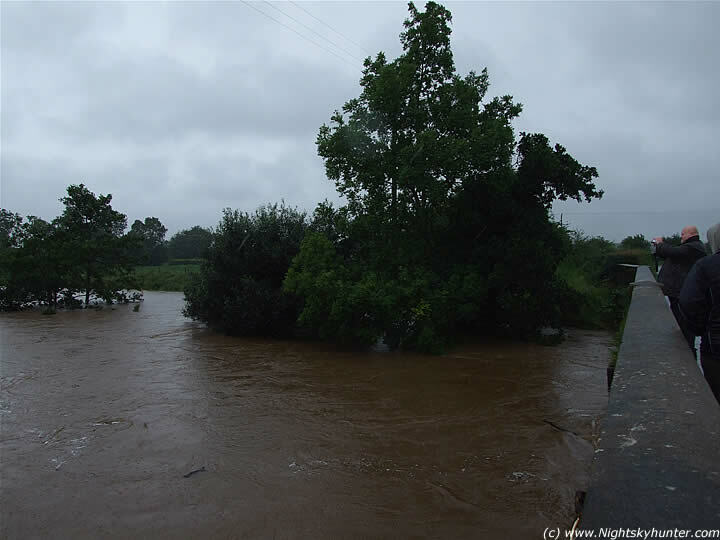 One of the collapsed bridges is at Fairy Glen, Rostrevor, Co Down and the other is on the Lurgan to Cahone road at Rathisland. The Northern Ireland Fire and Rescue Service said there had been ground-floor flooding in Belfast, Down and Armagh, and that every single one of its fire appliances was in use''. ''Crews have been pumping water away from homes in Carrington Street in East Belfast and residents were taken to emergency accommodation in the nearby Avoneil Leisure Centre. 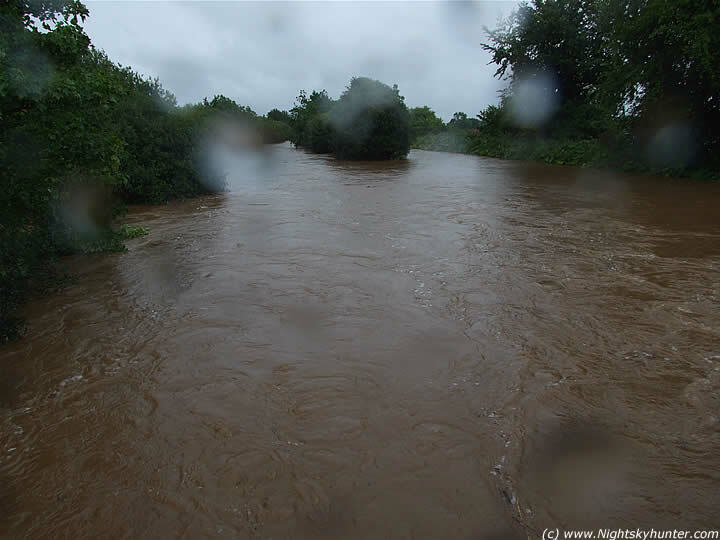 The Ballygawley Road and the Cookstown area of County Tyrone were among those flooded, and part of the Shore Road on the outskirts of north Belfast was closed after floods brought down a wall. Sporting fixtures, including several Carnegie Irish Premier Division football matches, were also hit, and the Ulster Grand Prix at Dundrod, Co Antrim was cancelled. Organisers earlier had to cancel Saturday's Ulster Grand Prix at Dundrod. NI Water said their personnel had received almost 3,000 calls which they were dealing with along with the Rivers Agency and Roads Service. 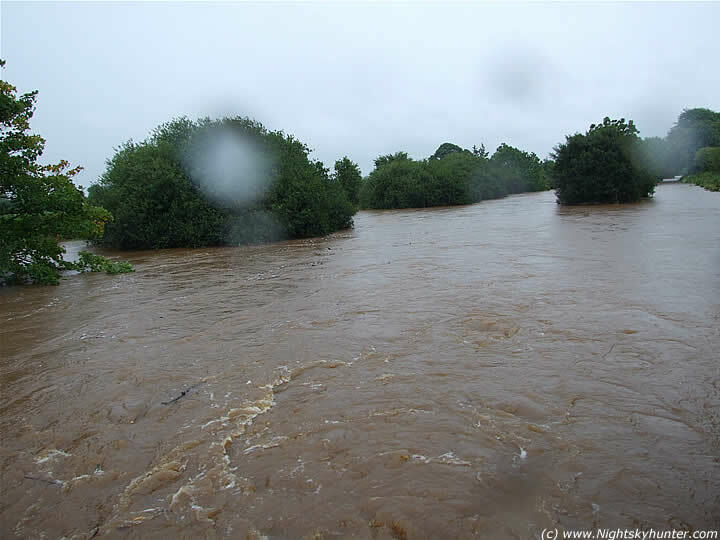 A spokesperson said persistent and heavy rain following three weeks of exceptional climatic conditions had caused the flooding''. "No system is equipped to deal with such intense rainfall which means that systems have become overwhelmed in some areas. "Staff and contractors from all three drainage agencies (Rivers Agency, Roads Service and NI Water) are working with the Fire and Rescue Service and are responding to all reported incidents as soon as possible "However, resources have been overwhelmed due to the scale of this event. All our sympathies are with any residents affected in what is clearly a distressing experience for everyone." ...BBC. I ended up missing the partial lunar eclipse that evening due to clouds associated with this event. What a day!. 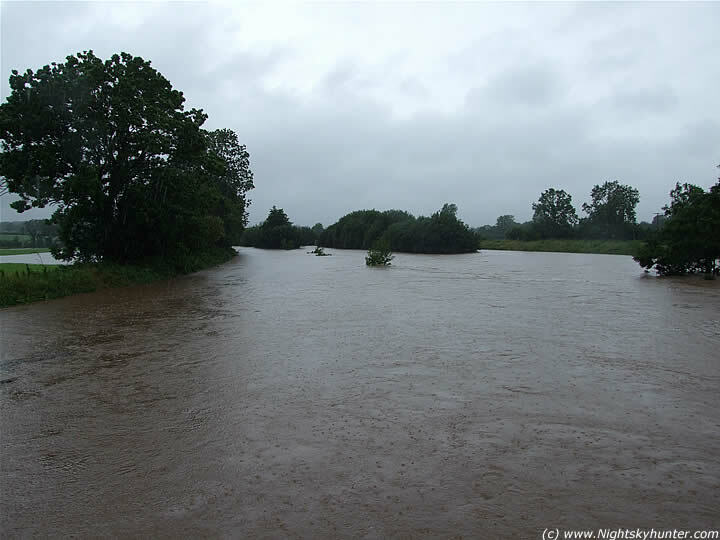 The local angling community are calling this the biggest flood in decades or 'The Great Flood Of 2008'. I fully agree. I hope the video conveys the scene better than the still images.